The organisation was established by a group of permaculturists and transitioners who joined forces to communicate, and inspire people about, the message of regeneration in Greece. 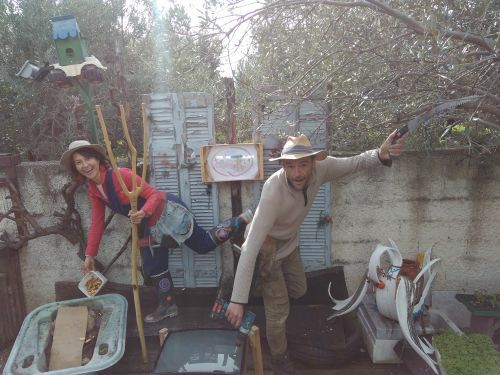 Compostopía is a co-created and interactive theatrical event about composting and upcycling. Before each event, it gets to know the bioregion and establish a dynamic Bioregional directory. This is a community database that captures the wealth of each bioregion in terms of the: people (skills, needs, offers), surplus (products, services, tools, machinery), resources (waste materials) and community issues that can be addressed by pooling resources. It integrates this information into a performance, which is delivered in conjunction with local communities. It engages and trains local youth in designing, organising and executing Compostop?a. It utilises wasted resources to make the stage/costumes. It integrates local organic farmers and producers by serving meals with their ingredients. After the performance, it brings participants together to kickstart or present projects, all based on reducing our reliance on fossil fuels, sharing resources, utilising waste and covering our needs with what it already has.